So it is with deep gratitude — for all the ambition, dedication, curiosity and tenacity that drives KPLU; for the year and ten months I spent tapping into that amazing energy — that I share some news about me: I’m moving to Los Angeles. I’ve taken a job covering education for NPR member station KPCC in Pasadena. I will leave KPLU on January 15. Set aside for a moment the extraordinary circumstances surrounding KPLU’s future — KPCC is offering me a chance anyone in my shoes must seriously consider. KPCC is one of the largest stations in public radio and one of the system’s strongest players. KPCC is big enough to put resources behind coverage of big stories, but has also shown it’s nimble enough to adapt. KPCC’s digital operation may be the envy of the public radioverse (I mean, just look at their mobile app). And KPCC has asked me to cover K-12 education in a region that includes the Los Angeles Unified School District — the nation’s second-largest. This is a chance to take over a big, important beat for a big, important newsroom. I’m leaving for that reason and that reason alone. I’m not leaving because I think KPLU’s days are numbered. In fact, I’m leaving despite great confidence efforts to preserve the station will succeed. In November, I was told to start looking for other jobs — we all were — and then I found KPCC. It was like searching for a lifeboat and having the Queen Mary steam up alongside. Then in December, the University of Washington and Pacific Lutheran opened up the bidding process and complicated an already-bittersweet decision. Forgive my lengthy explanation, but I don’t want my departure to distract in any way from a much more important effort: KPLU managers and supporters are preparing to launch a campaign to raise at least $7 million needed to purchase its broadcast license and divorce the station from Pacific Lutheran. If anyone were to read my departure as a vote of no-confidence in that effort, they’d be wrong. Without going into details that aren’t mine to disclose (they will be public soon), I’ll simply say this: it will not take a miracle to save KPLU. It will simply take hard, hard work. But it will require the people of the Puget Sound region to take ownership of its media landscape — to decide the buck stops here. To decide that this region deserves world-class journalism. Look around. The slope is getting more slippery: Although KCTS absorbed Crosscut — an encouraging development, I think — the PBS station also laid off 11 production staffers earlier this year. In what may be the most alternative city in the country, an alternative weekly shed a quarter of its salaried staff. 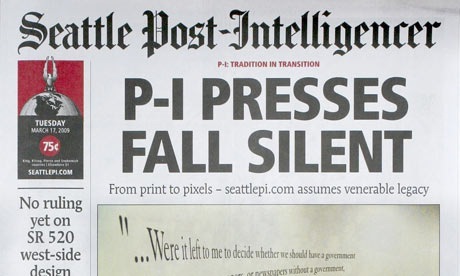 Perhaps most crucially of all, The Seattle Times will kick off 2016 by laying off perhaps a dozen journalists — all of this in a town that has already buried one great American newspaper. And then there’s KPLU: a “declining asset” only if its assessor is determined to appraise it as a collection of wires and lights in a box. Assess for yourself the value of a newsroom that stays curious and thinks big. Consider my bosses’ gamble that a promising-but-amorphous pitch from their youngest reporter might turn into a project like Renaissance Beach — what’s that worth to our community? Or the time they gave Ashley Gross and I to examine the state’s tax code — what’s that worth? What about the special website they built for Bellamy Pailthorp’s salmon series? And what about the creation of Sound Effect — a heavy lift in a station with a dozen or so journalists with daily newscasts to fill? Add all that up. A 1996 Honda Civic on its second transmission is a declining asset. In an era when journalistic net worth is measured in clicks, KPLU News is an increasingly rare and precious commodity. Nobody should have to experience the bizarreness that has afflicted us at KPLU since Nov. 12 — hell, I basically attended my own funeral and came back to life in the space of three weeks. Still, if — God forbid — you should ever find yourself in freefall, I hope all of you experience what it’s like to have a community rise up in your defense. That’s what many of you did. You stood up, said my name, cited my work and told the powers that be, loudly and clearly: this type of reporting is worth preserving. You have humbled and honored me. You showed me the “public” in public media. At my darkest times in the last two months, it sometimes felt like this was all I had. I thank you deeply and sincerely for that. But none of the work you cited would be possible if I worked for a newsroom that wasn’t worth nurturing, cherishing and saving. I know many of you know that, which is why you raised such hell about keeping KPLU around. It’s one of the most beautiful uprisings I’ve ever seen. But it’s not over yet — it can’t be if the effort is to succeed. So don’t let up. Don’t back down. I’ll be cheering you on, even if from afar. Thank you, Seattle, for 22 amazing months. I’ll be in touch. I won’t be far away. And one way or another — even if it’s only to clear the smog from my lungs with the fresh air of Cascadia — I’ll be back someday. Kyle Stokes, thank you for giving us a glimpse of the private turmoil that was going on behind the scenes at KPLU. Of course, we all knew that must have been the case, and it spurred us on to try to do our best to turn the situation around. Fortunately, we had a great ally in Cliff Mass, and a compassionate UW President, Ana Mari Cauce, hearing and responding to our concerns. As you say, the hard work of fundraising lies ahead! Thank you for your dedication to KPLU, and I wish you the best in your future endeavors. Kyke, thank you for what you gave to Seattle and all of its satellite communities. The quality of your and other journalist’s reporting at the station has set a high bar for excellence in independent reporting. So sorry for what has happened in the past couple of months but you have landed well and deservingly so. Don’t forget us as we embark on the hard journey ahead. You are still in the big and beautiful family of public radio – with many thriving branches on the same tree. You will be sorely missed Kyle–perhaps one day you can come back to community owned KPLU (or whatever it;s new call letters will be when we are community owned. And best to you–the new station has gotten itself a valuable asset! Thank you for this article. You make me teary-eyed, proud, sad, delighted, inspired. And I know and feel all of that as it comes from you as well. We will miss you, Kyle. I listened to your Renaissance Beach doc three times and will be happy to hear it again. I shared it with my family. It was enthralling and I don’t say that lightly. We need more stories like RB and thankfully, we will have the chance for KPLU to stick around and do more like this. I am sad you are leaving; you have been responsible for me sitting in a cold car in the garage on more than a couple occasions. However, I am very happy for you and wish you the very best in LaLa-Land. You will enlighten and inspire them, as you have us. Safe travels. Kyle, I will miss you so much! I’ve enjoyed getting to know you and I very much appreciate your high-quality reporting. KPCC is lucky to have you. Enjoy sunny LA! Thanks Kristen! You’ve been great to work with. Thanks for all your help. Thank you for your journalistic efforts & being part of the Team, Kyle. i can’t say enough how important “boots on the ground” reporting is to me, and to those of us interested in the Truth. We have lived in CA off & on over the last 20 years, and I have a reference you may find interesting once you get to PAS. email if interested. Best of luck to you Kyle! I have a feeling we’ll be hearing you from LA, telling the whole nation a story about LA schools!